The Shoring Operations Guide is an abbreviated version of the US&R Field Operations Guide (FOG) and contains Sections 1 through 4 of the larger FOG. This SOG is recommended for first-in companies not needing the full Structures Specialist reference materials. This publication has been printed by rescueDIRECT, Inc. with the permission of the United States Army Corps of Engineers (USACE). It is being made available at our cost as a public service to Fire Service and Technical Rescue Teams. Copies of this SOG may not be sold for profit by any subsequent purchasers. 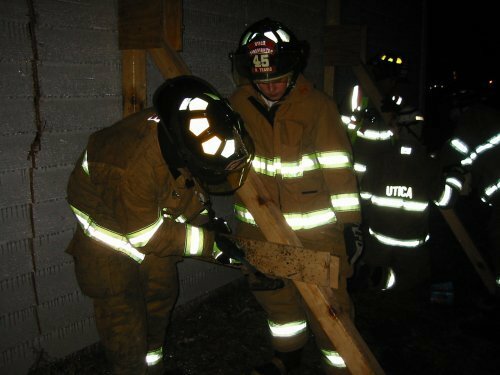 The U.S. Army Corps of Engineers USAR Shoring Operations Guide (SOG) has been prepared to guide smaller US&R teams and local fire/rescue department personnel to perform search, building assesment, and shoring operations during major disasters or emergencies. The pocket guide details such items as structural collapse patterns, hazard identification and building monitoring, rapid assessment of buildings, building triage and marking systems, and shore construction. Urban Search and Rescue is a dangerous undertaking conducted in buildings that are fully or partially collapsed. Typically, these structures are multi-storied and contain heavy debris with a high potential for additional collapse. Only those trained as structural collapse technicians can evaluate a damaged building in order to reduce the risks to rescue personnel and victims. The National Urban Search and Rescue (US&R) Response System provides for the coordination, development, and maintenance of the Federal effort with resources to locate, extricate, and provide immediate medical treatment to victims trapped in collapsed structures; and to conduct other life saving operations. The SOG is designed to provide an overview of the essential marking and shoring functions at incidents where technical rescue expertise and equipment are required for safe and effective rescue operations. These incidents can be caused by a variety of natural events (i.e., earthquakes, floods, tornados, or hurricanes) that cause widespread damage to a variety of structures, mass transportation accidents with multiple victims, or single site events such as excavation collapse or confined space rescue operations involving only a few victims.